Advances in technology have helped to create a plethora of entertaining and useful new products for pet owners, one of the most fun being the wireless pet camera. These devices stream video of your pet to a cell phone, computer or tablet, so pet owners can see what their dogs or cats get up to when they are out. They also have features that let you dispense treats to your furry friends, play games and speak to them. Some of these cameras can be a massive help for animals who suffer from separation anxiety, giving owners peace of mind their pets are safe and happy. Most of these cameras are pretty new and still have some kinks to work out, but we have searched through the expert and consumer reviews and have broken down what you need to look out for to help you find the best wireless camera to suit you and your pet’s needs. Two Way Voice: Most of the devices have at least one-way voice, but some of the pet cameras offer a two-way voice option. It means that not only can you hear any sounds that your pet is making, but you can also talk to them. Night Vision: If you are leaving your pet at night, you may want to consider looking for a product that has night vision. Night vision doesn’t tend to be a standard feature with these devices, so don’t assume that you will be able to watch your pet in low light unless it is specifically mentioned in the specs. Motion Detection: Motion detection is useful if you are going to be recording your pet to playback later or you want an email alert when your pet is moving. The use of motion detection technology allows users to avoid taping hours of inactivity. Treat Dispenser: One of the best features of these types of device is the treat dispenser option. If you have a pet who is overweight, then you will probably want to skip this feature, but pet owners who purchase products with this feature tend to love the ability to give a treat while they are away. The camera itself is the most critical feature of any of these devices. You will want to pay close attention to reviews about the resolution of the different options. A common complaint of these pet cams is that the resolution isn’t high. Companies generally tend to list the cameras as HD quality video streaming, although how companies are classifying this isn’t clear. The highest resolution that can be captured and stored is 704 x 480 (NTSC for the United States). Although trying to find the resolution specs on any of these devices is somewhat tricky, so it is hard to confirm exactly the resolution you are getting for each of these products. Another common complaint regarding pet cams is that there is a delay or a lag when viewing the streaming video. All of these types of camera (similar to security devices) have some delay versus real time; you can’t avoid it even if you buy a higher end product. In most cases, you will need a decent amount of light to get a good quality image, so before you set up the camera you should think about your lighting conditions and how much light is available where you want to set it up. Depending on where you are planning on positioning the camera and the temperament of your pet, you may need to think about how durable the device will be if your dog or cat tried to chew on it (to get at the treats if it has that feature). If you are planning on putting it in a crate, choose a unit that is made of durable material. Avoid a device that has corners, edges or electrical cords that can be chewed. Security is something that you need to think about when putting any wireless device into your home, as it is possible to hack a Wi-Fi camera. Most companies know that this is an issue, and have included different layers of security to ensure that your camera cannot be compromised. Although users need to make sure that they follow all recommended security precautions that companies suggest (i.e., use a long, complicated password). Cons: Treat dispenser is prone to becoming jammed. 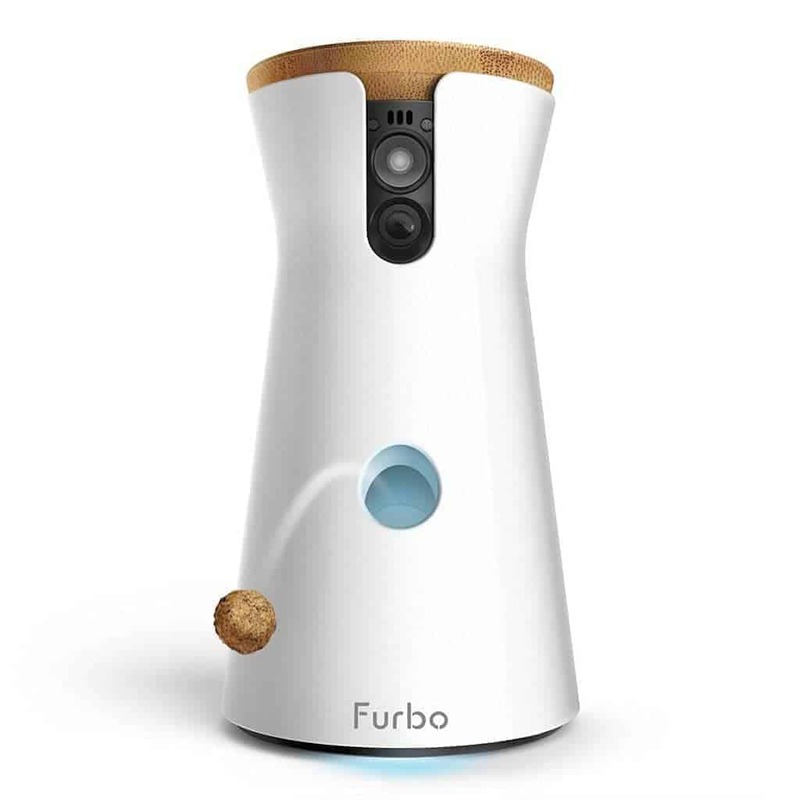 The Furbo is an excellent pet camera that lets you stream video to your smartphone, tablet, or computer so you can watch your pet while you are away. Pros: Has two-way video and audio call. You can use it from your pc, mobile or tablet. It has sound and motion detection. Treat and scent dispenser. Cons: Some users complain of choppy video and audio and find the camera to be kind of low resolution. There is also no night vision. It is a little pricier than some of its competitors. Overview: This is another option if you are looking for a treat dispensing camera that lets you communicate with your pet while you are away. 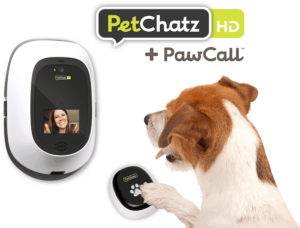 With PetChatz you can give your pet treats remotely as well as have a calming scent sprayed out. What do users love about PetChatz? Users love the ability to calm and connect with their pets using treats and the scent. Reviewers like that the device rings when you are calling your furry friend. It is easy to set up, and the company offers excellent customer service if you run into problems. Some of the issues like the camera being somewhat low resolution will most likely be fixed with the PetChatz HD newer version, although it still doesn’t seem to have night vision so you may have to keep a light on if you want to watch your pet at night. System Requirements: Need a pc, tablet or smartphone that has webcam capabilities. If you are using the app to view they currently only have an app for IOS, you will need iOS 8.1.1 or later. Pros: Lets you play laser games as well as watch and talk to your pets. It has an attractive design. Cons: Reports of crashing users Wi-Fi and trouble connecting the camera to the Wi-Fi network. Overview: The PetCube has a wide-angle lense along with real-time HD video so you can view your pet when you are away from home. You can also talk to your pet as the camera has a built-in microphone and speaker. 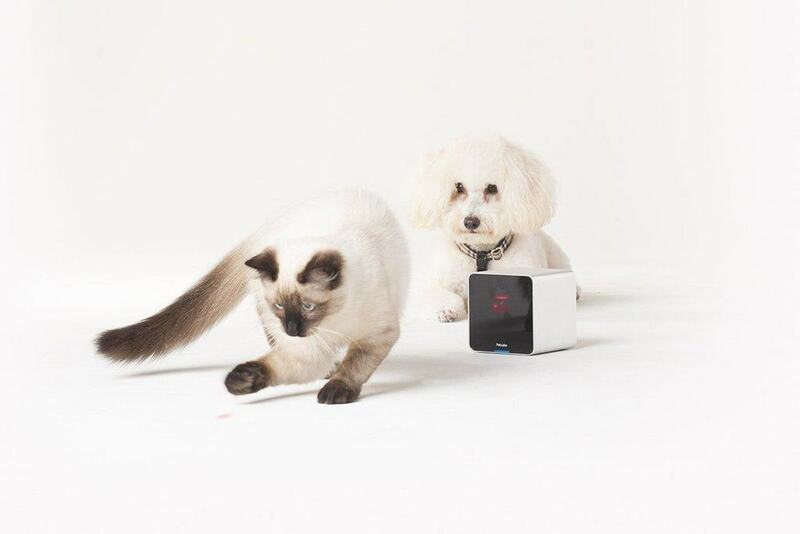 The unique feature of the PetCube is the laser pointer toy you can play with your pet from your smartphone. What do owners love about PetCube? Users have reported issues with the system crashing their WI-FI as well as connectivity problems. System Requirements: OS and Android compatible. Android should have version 4.0 or higher. 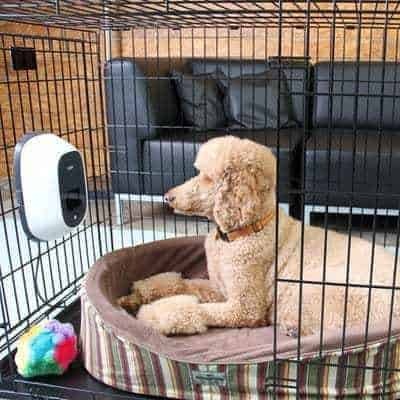 If you have a pet who suffers from separation anxiety or you love your dog or cat so much that you want to be able to check in with them through the day when you are away, these pet cameras are a fantastic investment. They let you play games, give treats, talk to them, hear any sounds that they may be making and best of all, watch them as they go about their day. While these pet cameras may have some flaws that will hopefully be fixed in future models, these are a fun way to connect with your furry friend that will bring you and your pet many hours of enjoyment and peace of mind. If you buy something through one of the links in this post, CWB may make a small commission from the sale. Click here to learn more.